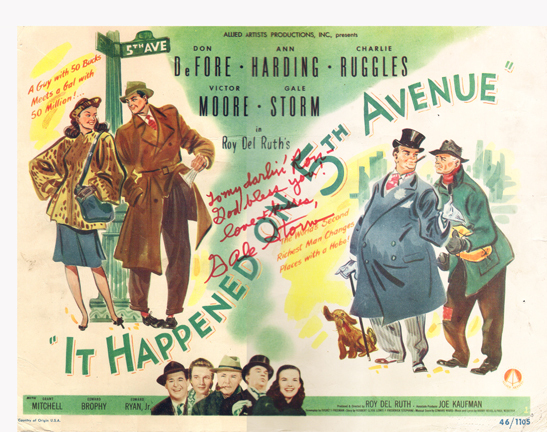 I’d never heard of IT HAPPENED ON 5TH AVENUE until it’s recent broadcast on TCM. This unsung little holiday gem was a TV staple for decades before being pulled from viewing in 1990, only resurfacing in 2009 when a small but dedicated band of classic film fans put the pressure on to see it aired once again. And I’m glad they did, for this charming, unpretensious comedy boasts a marvelous cast, an Oscar-nominated screenplay, and a Frank Capra-esque feel without a lot of the Capra-corn. This entry was posted in Film, Film Review and tagged Alan Hale Jr., Allied Artists, Ann Harding, Christmas Movie, Cracked Rear Viewer, Don DeFore, Gale Storm, Gary Loggins, It Happened on 5th Avenue, Roy Del Ruth, Through the Shattered Lens, Victor Moore. Bookmark the permalink.